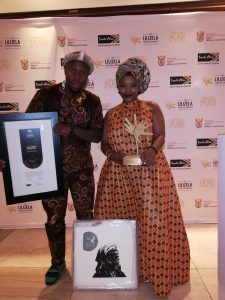 FOR THE first time-ever Vomba Tours from Mpumalanga won its first national award after bagging the 2018 Lilizela: Eteya category. Managed and owned by the soft-speaking Khimbini Hlongwane, the ecstatic winner in his own words remarked “if feels good to be honoured by peers”. And the winner…Lebo’s Backpackers duo Lungile Mbangula and Thami Khumalo posing with their accolades at the National Lilizela Awards ceremony in Sandton. Images SLM. Once a cattle herder from a little village in Mpumalanga and now the managing director of a tour company Hlongwane, bears evidence to what can be achieved through determination and passion. Vomba Tours & Safaris, a tour operator based just outside the Kruger National Park in Mpumalanga was established in 2015. “Now more responsibilities have been added with this prestigious award. Although we’ve been doing fairly good in terms of business, this honour means more attention in terms of how we position the brand and responsibilities by my staff out-there. No room for errors or oversight. For the masses of Mpumalanga who have been behind the company, this is for you,” he chuckled feverishly. In his usual tranquil mood Hlongwane, who unfortunately did not read the memo (the invite stated African attire) clad in jacket and jeans- also attributed this achievement to the Mpumalanga Tourism Parks& Agency who played a significant role in shaping him. The sixth edition of the National Lilizela Tourism Awards was hosted by broadcast veterans, Xolani Gwala and Leanne Manas, held at the Sandton Convention Center last Saturday night. Lebo’s Backpackers (Soweto) also won their fourth Lilizela Award in the Backpacking & Hostelling category. Representing the company in the absence of founder Lebohang Malepa, the duo said bagging this award shows commitment in keeping people happy, safe and having a time of their lives with Sowetans. Lungile Mbangula and Thami Khumalo (clad in respective African regalia) in unison retorted they don’t take things for granted and will always strive for excellence to promote and market the brand and Soweto to the outside world. “It is a real privilege to be here with you to celebrate your successes and achievements. That’s what tonight (Saturday) is all about: recognizing and rewarding tourismplayers, businesses and the people on the ground who collectively make South Africa the great global destination that it is,” said Minister of Tourism Derek Hanekom, who has been labeled ‘Chawe’ by locals in the Eastern Cape. Recipients of the National Lilizela Tourism Awards 2018 received art piece by various local artists represented by Business and Arts South Africa (BASA) and Artist Proof Studios. Bongani “Stevie Wonder” Mbambo- due to his blindness, Zakes Bantwini and the legendary Sipho “Hot-Stix” Mabuse led the evening’s entertainment. ONCE in Joburg (Braamfontein) won the Best Backpacker accommodation in the whole of South Africa. They have another establishment in Cape Town.